Sally Lunn aka Boston Bun, image courtesy of and © Full Little Tummies blog. A friend turned up to stay for a couple of days, toting a pile of goodies for me – including a stack of early 1970s Woman’s Weeklies. In between reminiscing over the ads – the conversation quickly turned to fondly remembered baked goods of yesteryear – in particular from the Lane’s bakery chain including the classic crescent rolls and of course the ubiquitous Sally Lunn. 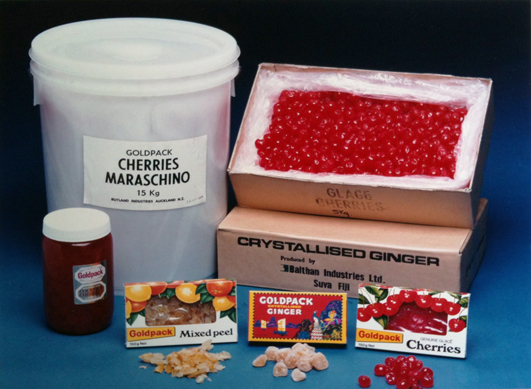 (Lane’s was founded in the 1900s and, based around the central and north area of Auckland – had stores in Takapuna, Milford, Devonport, Browns Bay, and Greenlane – going out of business around 1979, according to records). I wondered out loud if the Sally Lunn was as uniquely New Zealand as I assumed it was – and imagined that like most of these classic Kiwi things from the Boomer and X generation I investigate – there wasn’t going to be any documentation on the actual origins to be found. Before I knew it my curiosity was piqued. The earliest publishing in a paper of the recipe for Sally Lunn. Evening Post, November 1881. I don’t know what is particularly “Darjeeling” about this bizarre styling of the recipe or what “burra consomah” means ( or even what language it is, one could assume it is Bengali, but apparently not). Courtesy of the National Library of New Zealand. Was there an interesting story there, or any story at all? 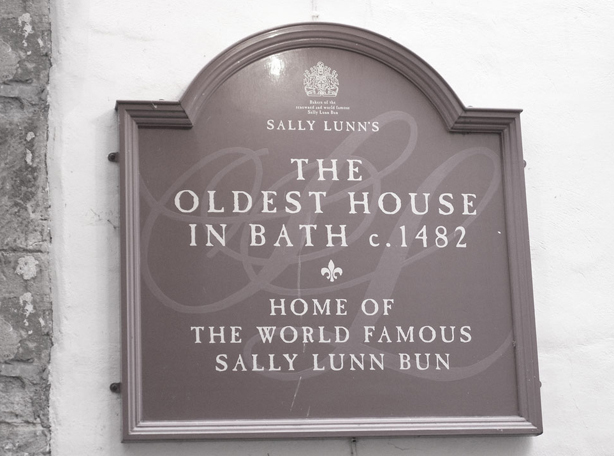 And was Sally Lunn actually ever a real person ? Most importantly, was it a Kiwi creation we could claim as our own? Well, sort of to the first question, likely no to the second, and it seems a yes to that last one. The traditional Sally Lunn actually has its origins in Europe (likely France), and the “official history” is surprisingly well documented in that it is repeated in slightly different variations all over the place. In fact the house with the original bakery where it was supposedly created, going back to 1482, still stands in Bath, as a museum and eatery. 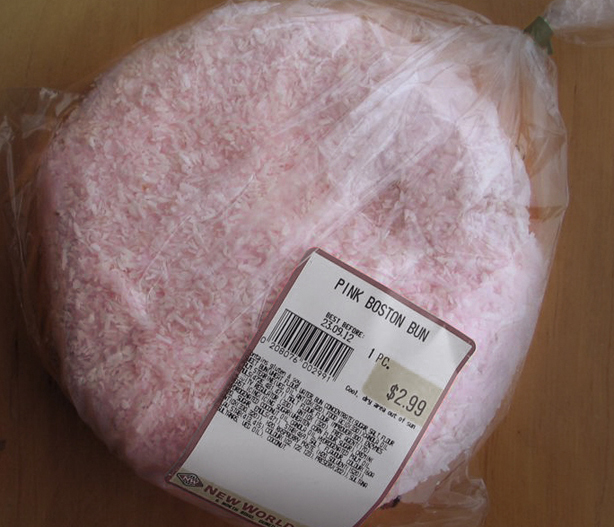 Pink Boston Bun, courtesy of and © Leigh C Russell, Rushleigh The At Home Chronicle blog. However the Sally Lunn that we are familiar with today has absolutely no resemblance whatsoever to what is considered the rather humble, genuine and quite particular British one. The original Sally Lunn, aka the Bath Bun, is a large, plain, almost saucer size bun (it looks a lot like a Wimpy burger bun to me) and similar in texture to brioche – which makes sense since apparently Solange Luyon was a French Huguenot refugee whom, escaping protestant persecution in her home country, arrived to Stuart period Britain in 1680 and found work at the bakery in Lilliput Alley (now North Parade Passage) – starting as a street hawker for the business. 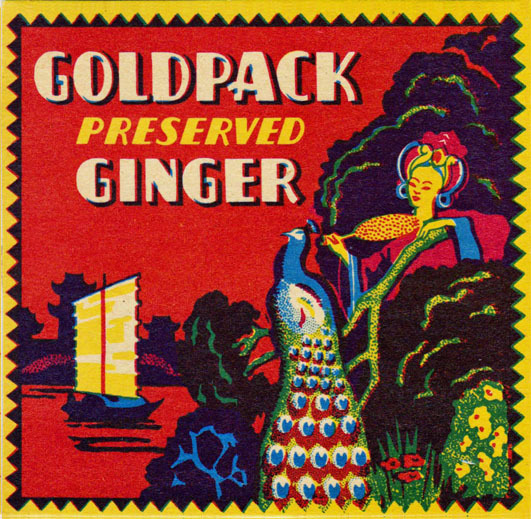 Soon enough her creation became a popular delicacy eaten with sweet or savoury accompaniments and she was relegated to the bake-house full-time to do what she did best. 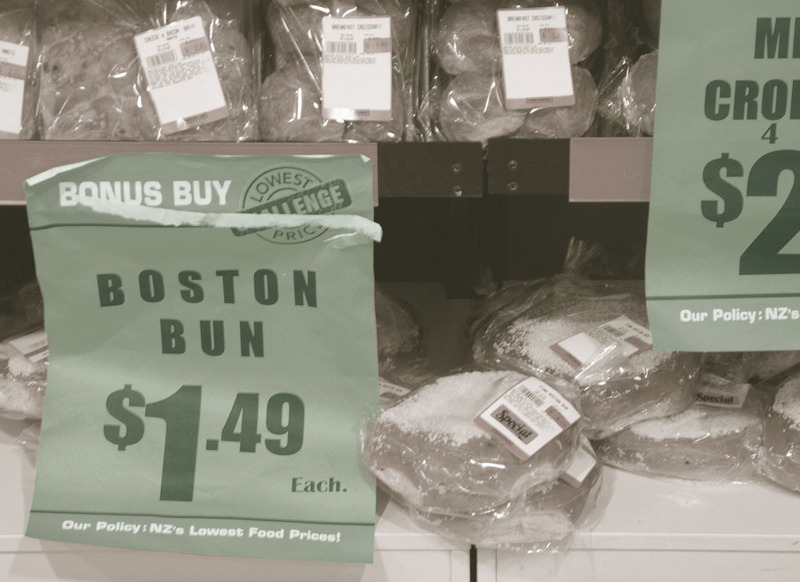 Boston Buns in a Canterbury PAK’nSAVE. Image courtesy and © testpatern on Flickr. 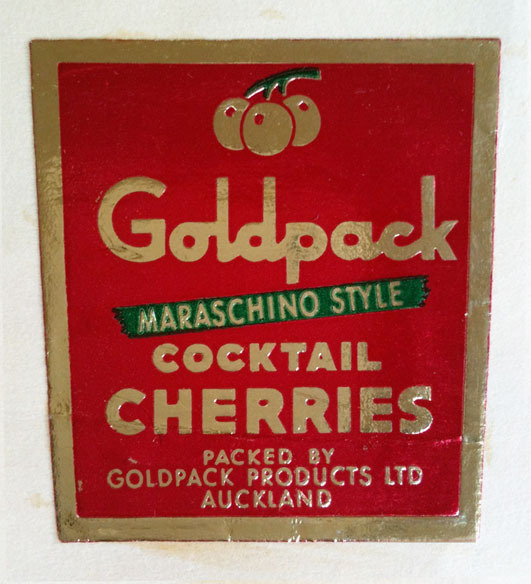 Anyway, opinion from historian quarters seems to be that this story – and the one about her original recipes being found hidden in a secret cupboard during renovation – is a bunch of hooey and there’s no proof that Sollie or her stashed scribblings ever really existed. Stories coming out of the museum wildly differ . One is that the secret recipe is locked away with the original house deeds. Another is that they were conveniently lost by an owner when the need arose to produce them. Not to mention that the cast iron stove they claim she cooked on – would not have existed – and therefore have not been in use until around 1800 when they were invented. It is suspected that the whole thing may be no more than a fanciful story created by artist Marie Byng-Johnson to create a bit of publicity (and ergo, cash) when she bought and renovated the building in the late 1930s and relaunched it as a business. In other words, “totally bogus” as my friend with the Woman’s Weeklies would offer. Sally Lunn’s House and Museum. Image courtesy and © rmballde on Flickr. Another part of the apparent saga is that French chef, Antoine Careme who was the Prince Regent’s chef for a short time in Britain , cosied up to Sally and stole off with her bun recipe, transformed into a teacake which he renamed and presented in his home country as the Solilemme. Now I really think this one is nonsense. I doubt the French would steal gastronomy from the English! However the Solilemme, or Soleil et Lune (Sun and Moon Cake), does sound a lot like “Sally Lunn” when called out – so you can imagine that, in a similar fashion to my story a while back on how Hokey Pokey got it’s name through verbal distortion, it became what it is today via bad pronunciation, laziness, and lack of attention to detail. When in doubt – dumb it down. The Dalmer version of the Sally Lunn story – in which she’s never mentioned as being French. Auckland Star, July 1933.Courtesy of the National Library of New Zealand. Regardless, the variation of the story with the poor put-upon foreign émigré and her white cloth-covered basket trolling the alleys is the most popular and has now entered common vernacular as “the real deal” well and truly – there is no going back. Sally undoubtedly had perky buns, but for all the tale’s persuasive cutesy charm she may have been an unattractive, foul-mooded old harridan – and possibly even the very individual that locked the baker apprentices in a cupboard (according to a museum sign). And maybe not French at all. 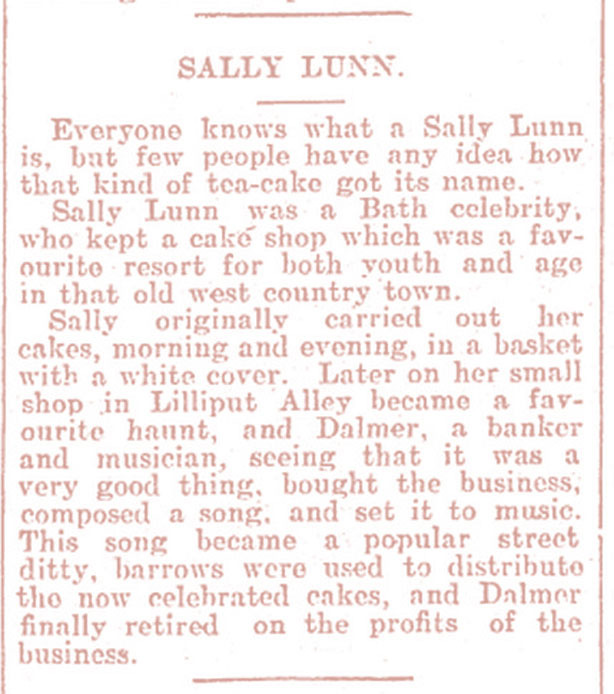 The Dalmer version of the Sally Lunn story – in which he writes a song about her that becomes popular and makes a fortune off buns and music royalties. Wanganui Chronicle, January 1912. 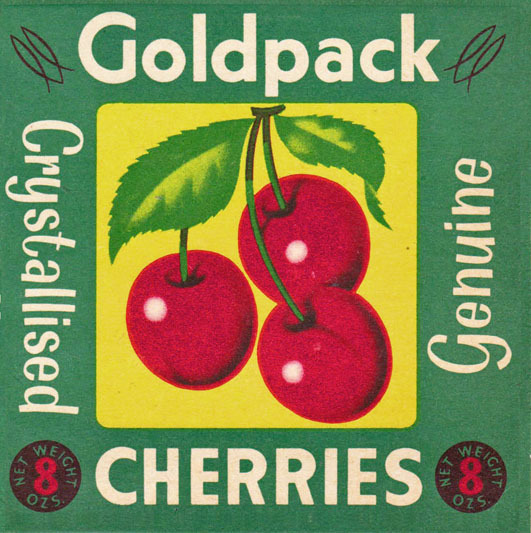 Courtesy of the National Library of New Zealand. 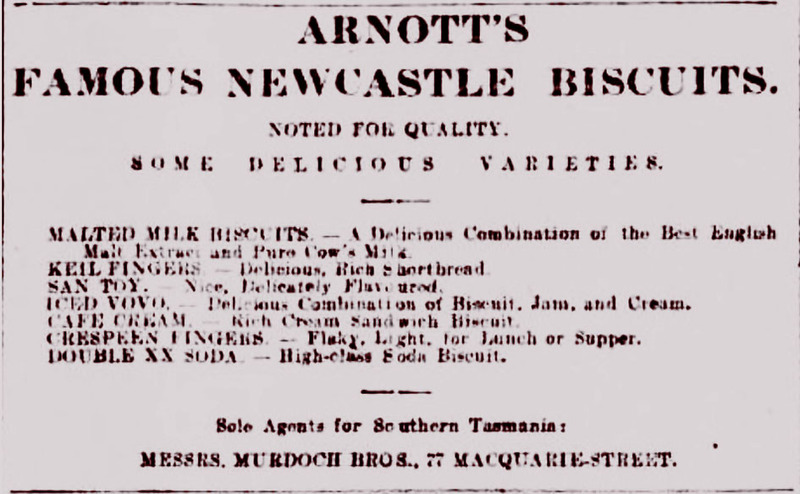 To prove a point – the histories of her and her tasty creation I found in early New Zealand newspapers even wildly differed by a century. However in my experience, there’s usually a scrap of truth nestled in the origins of a ludicrous-sounding story somewhere. Like most legends that get passed from one source to the next they change dramatically in the re-telling and are embroidered upon or adjusted for maximum palatability until they barely resemble the original (basically, the main theme of this whole article). All that aside, as Diana Vreeland was known to have said – “it is permissible to lie if it makes the story more interesting.” I can’t see a problem. 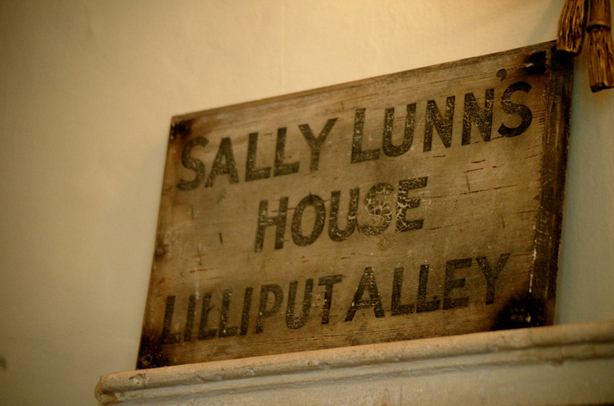 Old Lilliput Alley sign in Sally Lunn’s House and Museum. From my research this story was being perpetuated in print in New Zealand as far back as the 1870s that I can find – disproving the theory that Byng-Johnson came up with it, at least – on her own – but no doubt gave it an almighty shove. However it is not the only story around if one cares to look into it a bit more. 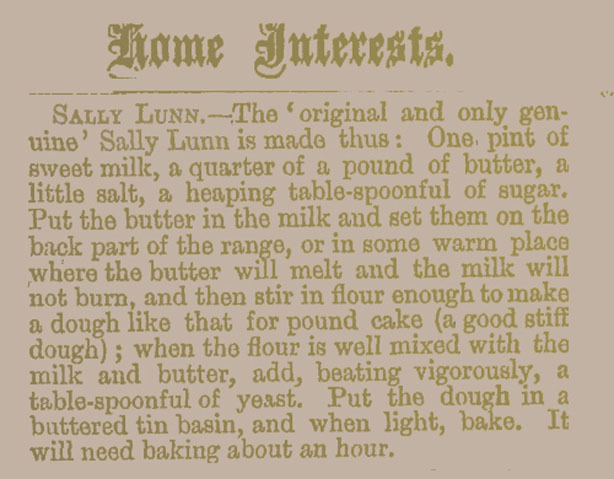 The bottom line is that a reference to the Sally Lunn did not appear until a century after they say she started making them (Dickens then mentions them in a short story in 1812), and published recipes following from the 1830s. 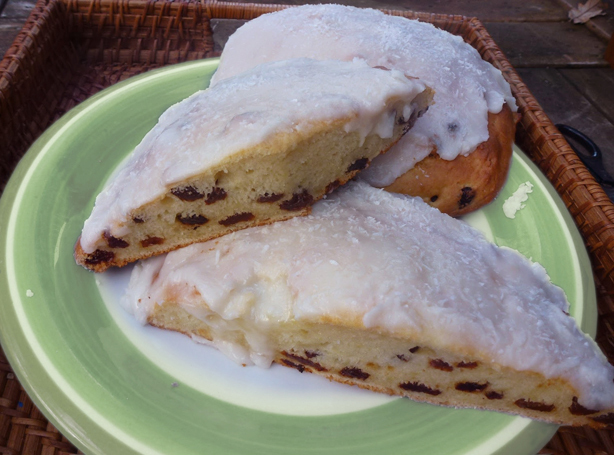 By the 1870s the treat had been immortalized in song in the comic opera “The Sorcerer” – “Now for the muffins and toast, now for the gay Sally Lunn… the rollicking, rollicking bun…” So how did it metamorphisise from a fairly plain roll into a frosted, baroque fruit bun, more reminiscent of Easter on steroids – and more to the point -why? 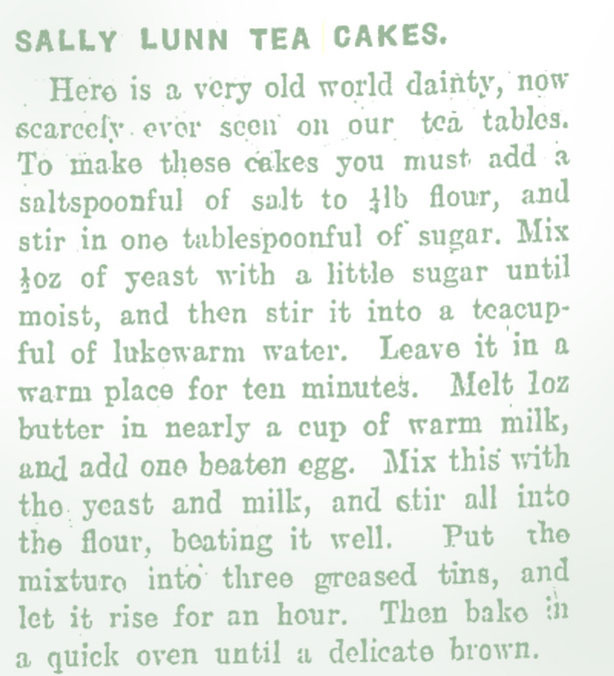 Sally Lunn recipe, Clutha Leader, May 1890. Courtesy of the National Library of New Zealand. 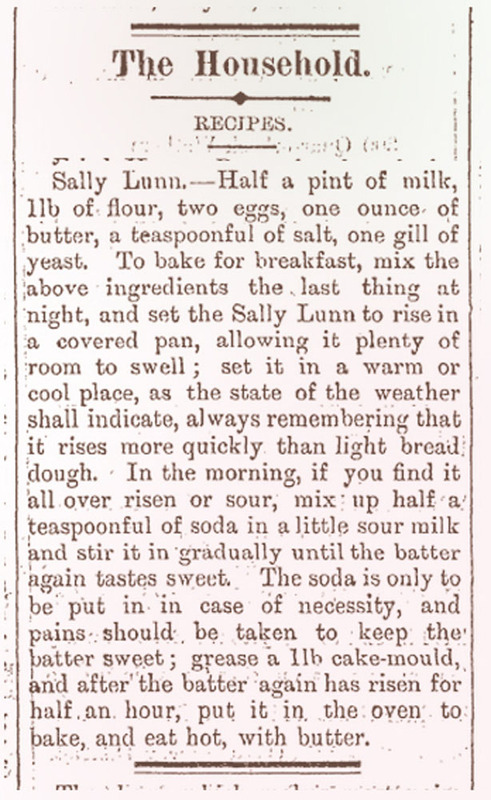 The very earliest actual recipe I could find published in a New Zealand paper named “Sally Lunn” was in 1881. I am sure there are no earlier ones, since the first Aotearoa-published cookbook was 1887. 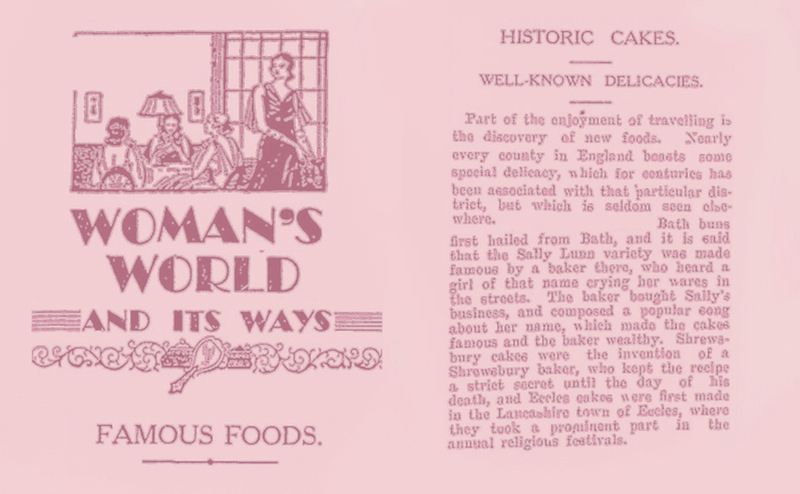 Telling is a recipe given of April 1882 which begins by stating – ” The original and only genuine Sally Lunn is made thus…” insinuating that the tradition had already been corrupted by then. 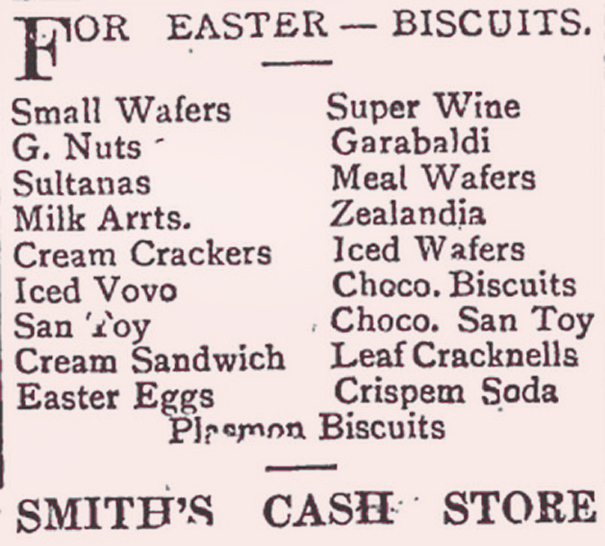 Another in the Otago Witness of October makes mention of the use of baking powder in the “so-called “Sally Lunn ” having little in common the genuine article…” Certainly through the 1870s the Borwick’s company were captalising on the new-fangled chemical cooking assistance – by recommending use of their product to make them. By the 1910s the traditional Lunn seems to have fallen by the wayside. 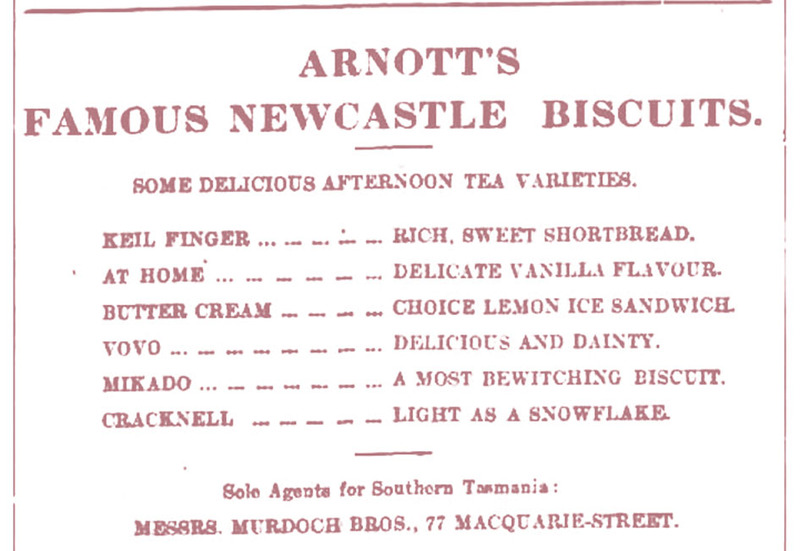 A newspaper recipe of 1916 describes it as ” a very old world dainty, now scarcely ever seen on our tea tables”, denoting that the original version had truly gone out of fashion by then. 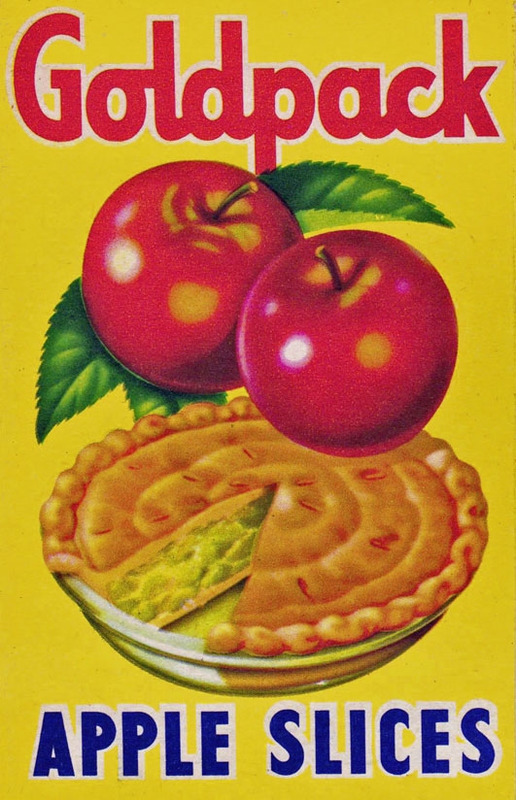 By the 1930s and on they are considered a retro curiosity, an Australian article of 1947 now describing it as a “food oddity.” Like New Zealand, there was a history of recipes along similar lines of the traditional version in that country – as well as in the U.S. where Sally Lunn was published as a recipe from 1845 onwards – first adopted by the Quakers and eventually the bread with a slight modification, became a somewhat Southern tradition. 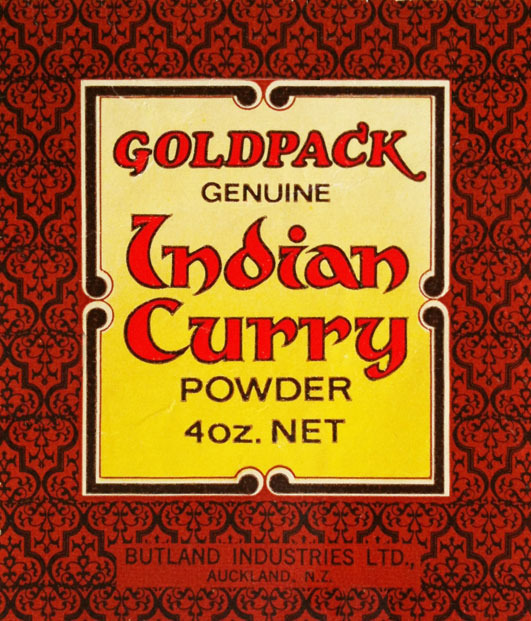 A New Zealand recipe of 1882 mentions it as “(the) genuine (recipe), as made in Virginia kitchens”, insinuating it originated there. At least they got it right in that it was the correct, traditional recipe even if their geographical history was shonky. Home-made Sally Lunn. Image courtesy and © Jocelyn at Mamas Style blog. 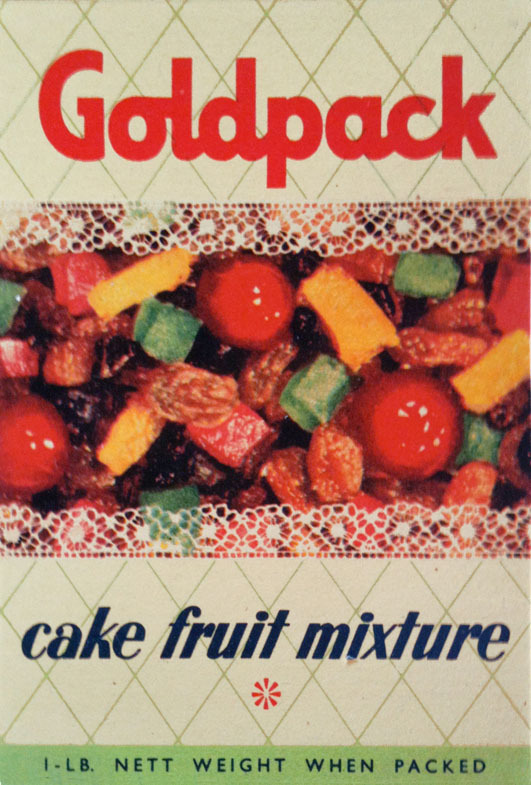 In summary, in not one recipe between the 1840s and the 1940s – anywhere in the world – are dried fruit, coconut or even icing mentioned. And at no point has someone taken a look at the (now considered classic) New Zealand version, stuck their hand up and said – “hey, this thing is NOT a real Sally Lunn”, except for Virgil Evetts who wrote along similar lines in his entertaining article “Sally Lunn, Moon & Sun” here, questioning just about all the same things that I am now. 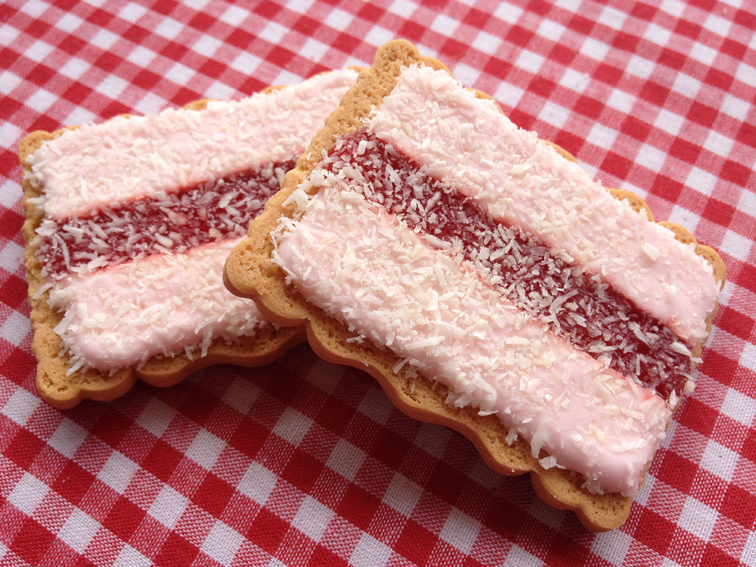 The New Zealand version is a doughy fruit-studded round or log with thick white or sometimes pink icing spread generously over the top – finished with lashings of desiccated coconut. Sometimes food colouring is even added to the dough to make it pink in hue. 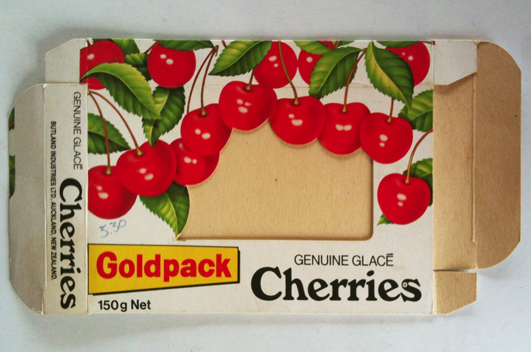 At the tuck shop they were usually shaped in long finger buns for individual serving convenience. 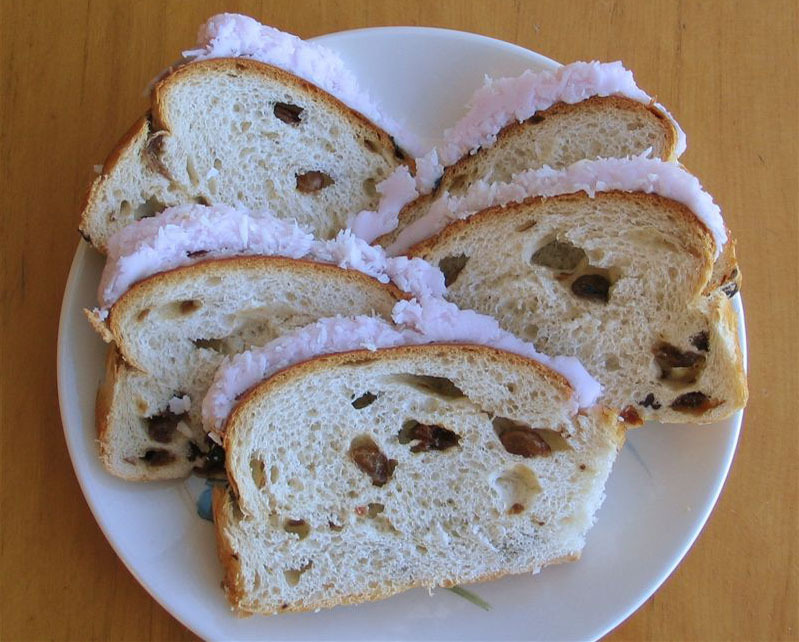 Something similar – iced, coloured and flavoured was known as the London Bath Bun and had developed in England over a number of decades – except in New Zealand of my youth it was called a Chelsea Bun and was quite a separate thing from the Kiwi Sally Lunn – being a flat, sweet spiral with currants and pink icing glaze. 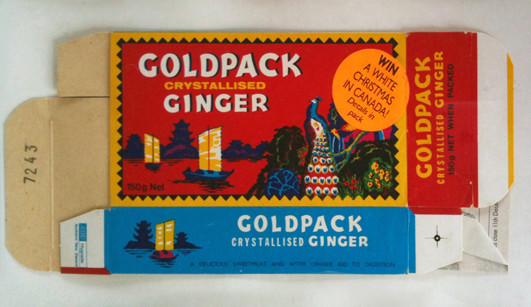 It was flavoured with cinnamon , and there was no coconut. 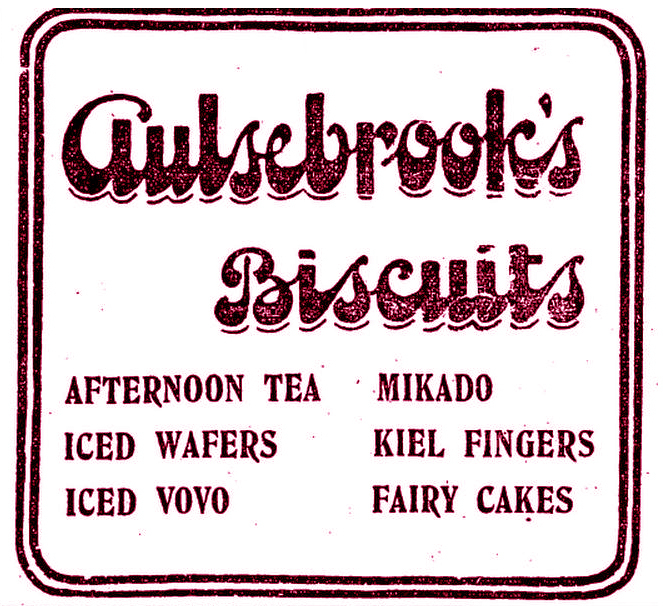 The description, noted by the late 1970s at latest, sounds in theory very similar to the Sally Lunn of Aotearoa we are familiar with from our youth – yet is not the same thing side by side at all – the classic British iced finger bun is more similar to the New Zealand Sally Lunn as we know it. 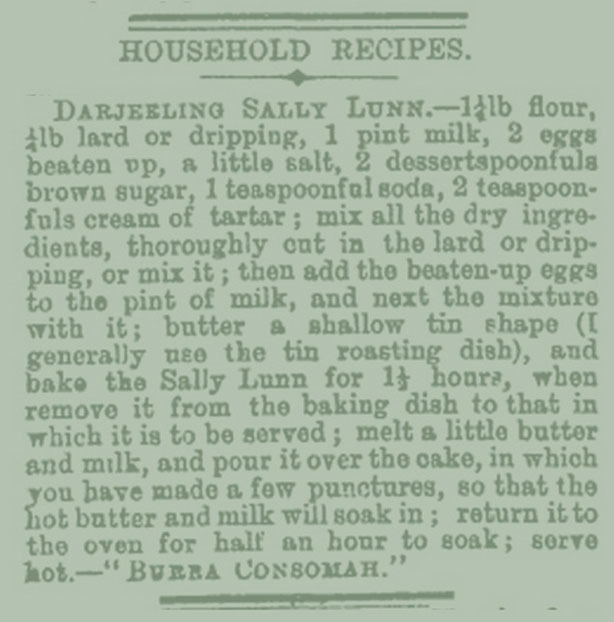 Original and genuine Sally Lunn recipe, Otago Witness, April 1882. Courtesy of the National Library of New Zealand. I was really hoping that the Sally Lunn was something that Aotearoa had taken from England and run with – but there doesn’t seem to be much evidence of any relation. It’s more likely that it is simply what is called a Boston Bun – ” a large spiced bun with a thick layer of coconut icing, prevalent in Australia and New Zealand. Traditionally the bun contained sieved potato, and sometimes raisins. It is served sliced, to accompany tea. The origin of the name is unknown. In New Zealand they’re often called a Sally Lunn, especially in the North Island…”, according to ever-reliable source Wikipedia. 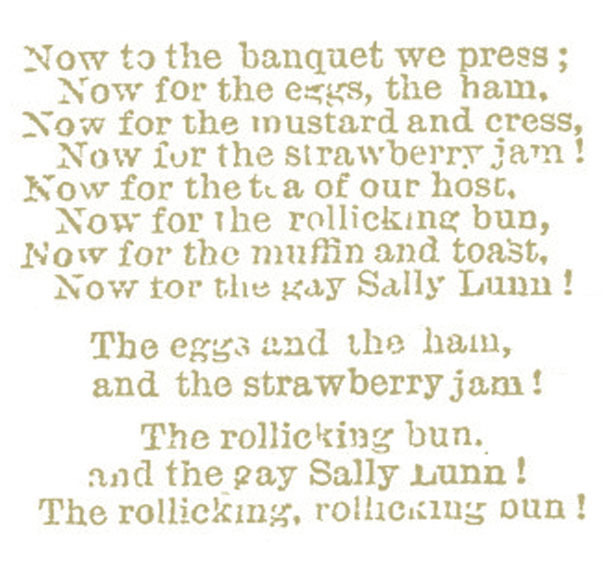 Sally Lunn song from the comic opera “The Sorcerer.” Auckland Star, January 1878. Courtesy of the National Library of New Zealand. Many of the recipes include mashed potato, which was frequently used to bulk out baking during the years of war time rationing. 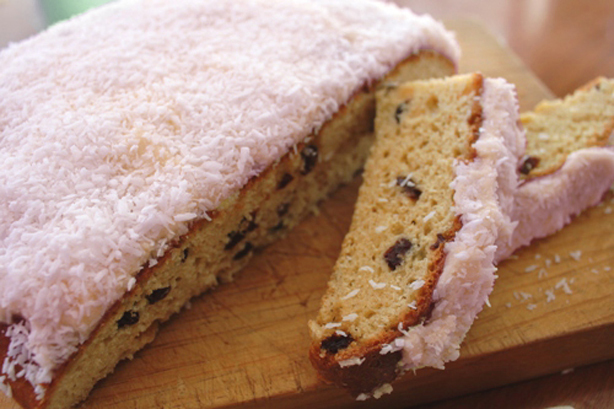 I started to develop this tenuous theory around war time restrictions in effect having to do with the modifications to the Sally Lunn that stuck, and compensations that were elaborated on – but doesn’t really account for the addition of sugar (of which only half the usual amount could be used by commercial enterprises at the time), dried, fruit, coconut, and heaps of butter, or even vegetable fat – all which would have been considered hard-to-get and/or luxury items that were limited as late as 1950. That said I could not find a single reference to the Boston Bun before the end of WWII. 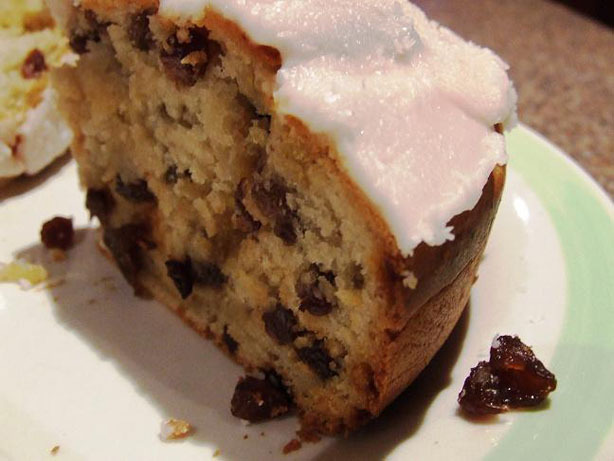 All the contemporary recipes for Boston Buns I found do actually accurately resemble the Sally Lunn we know today (sugar, raisins, currants, icing, coconut) more than the British article ever even vaguely did. The Boston Bun has no relation to Boston, Massachusetts, in the United States that I could find, (I checked with a U.S. born and bred chef friend who has a penchant for the trashy and pop and she had never heard of such a thing) nor does there seem to be any association with Boston, Lancashire, anything in the history to hint at it, or a recipe for a British “Boston Bun” . 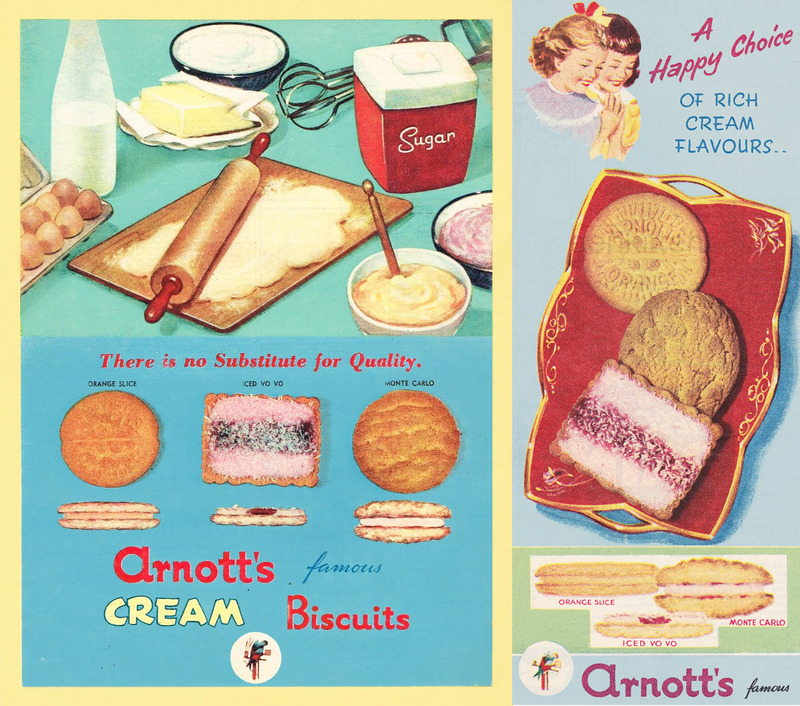 However I did find some references to Australian recipes and I will make an assumption that the Boston Bun actually IS unique to Australasia and was probably developed in the 1950s or 1960s. 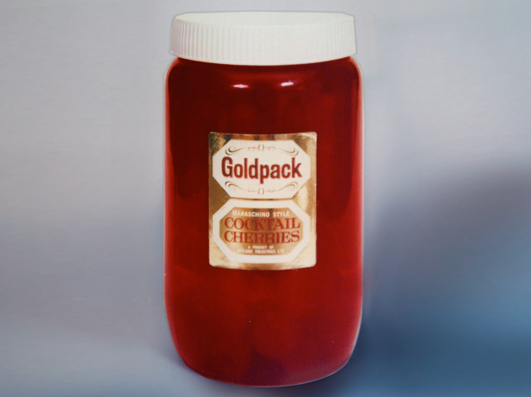 Who came up with it and why they named it as such – we will likely never know. Food fashion of yesteryear: Maoriland Worker, June 1916. Courtesy of the National Library of New Zealand. The curious Lunn; a beguiling bun. In summary it turns out it is essentially not much more than the Boston renamed – probably because it sounded cute to school kids and rhymed with its namesake. Intrinsically Kiwi? It seems so, as long as you can ignore the fact that someone with a complete failure of their imagination named it after something that already existed and which had no resemblance to it – which is just irritating and rather stupid, not to mention misleading. And not so much “old school” it seems, if you are prepared to look further back than a couple of generations. 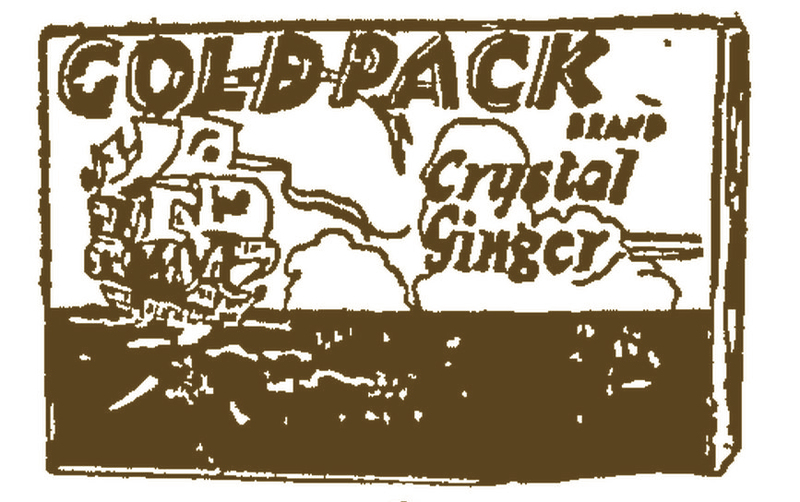 So you can lower your napkin to half mast on the great history of the old treat. 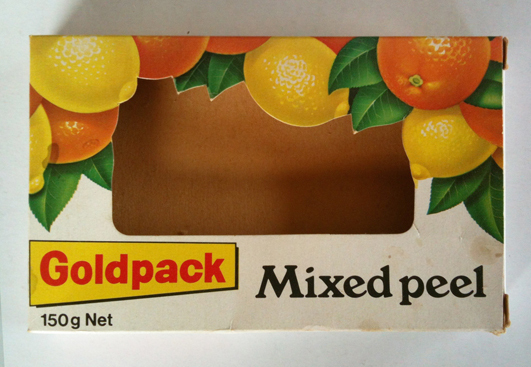 Regardless, it still brings back fond tuck shop memories for many though. Sally Lunn, courtesy of and © Virgil Evetts, foodlovers.co.nz. 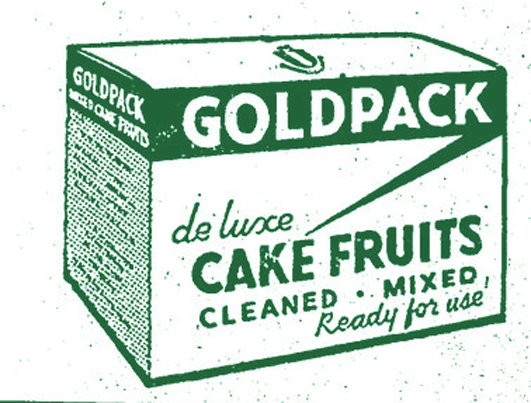 Update, mid June 2015: A major breakthrough in the post 1940s Sally Lunn story reared its coconut-sprinkled head in the form of some recipes from one of the many tomes issued by Maude Basham over the years. The ‘Aunt Daisy’s Favourite Cookery Book’ which was first printed 1952 by Whitcombe & Tombs (and re-issued for a number of years following) contained two recipes. One was ‘Sally Lunns with Baking Powder’ and the other was ‘Sally Lunns – Real.’ I haven’t seen the actual recipes so I have no idea what the difference was between them. Also, there was no recipe provided for ‘Sally Lunns – Unreal’, which is, ironically, a truthful statement, and may also have provided more clues. 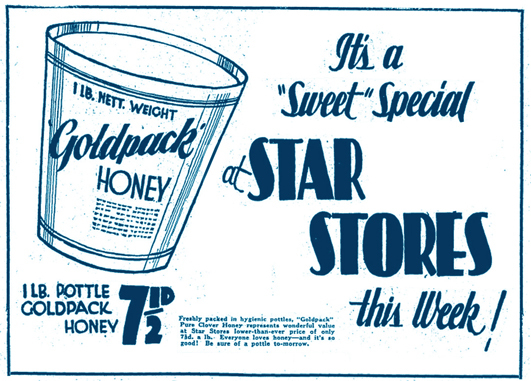 But more significantly, this advert dated December 1952 from the Pahiatua Regent Theatre Film Schedule , which was printed regularly and distributed to every home in the district, funded by the local business advertisements within, shows that the local home cookery had probably been making them for some time. 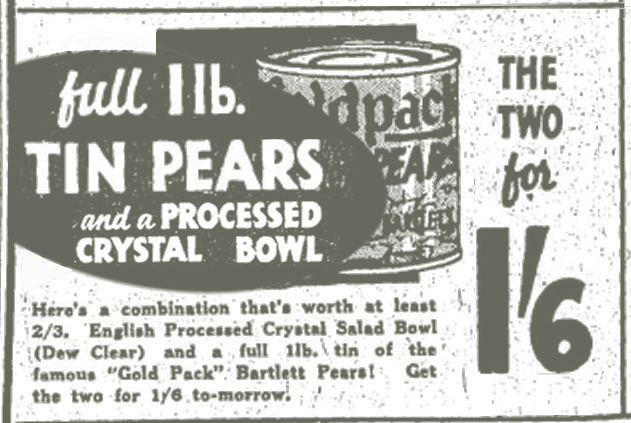 We can assume this was before Aunt Daisy got around to it in an official capacity by putting the recipe in print. a All content of Longwhitekid copyright Darian Zam © 2013. All rights reserved.